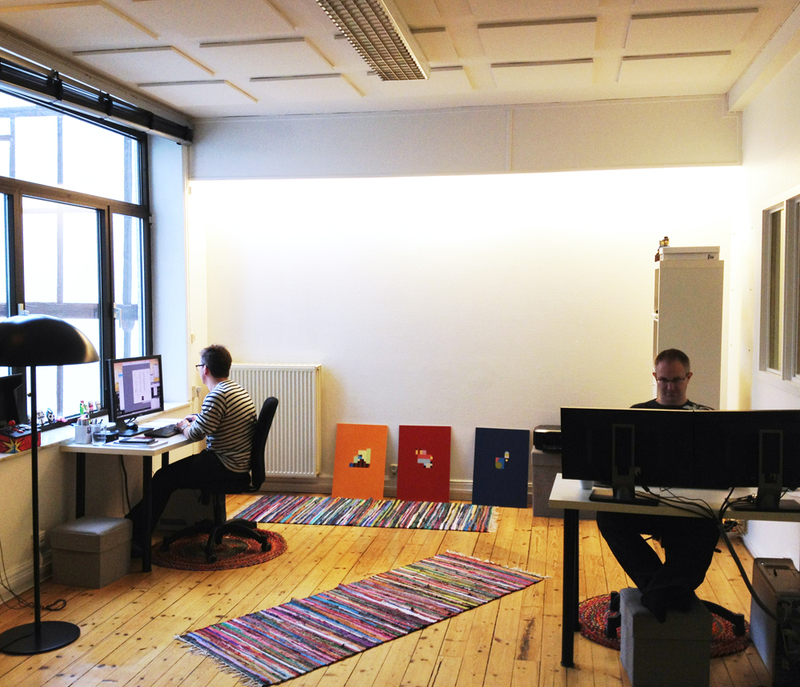 Simogo's new office. Look how busy these guys are! Simogo doesn’t make games like most studios. It doesn’t do design docs, meetings strike it as silly, and it doesn’t get rattled when something isn’t working as intended or a game needs to be delayed. It can be different because its games are the product of an improvisational style of development that sheds structure when it impedes an organic flow of ideas, analysis, and feedback. Simogo calls this “jazz development." It’s a good name. Simon Flesser and Magnus “Gordon" Gardebäck are the two dudes behind Simogo. They’ve been working together for over five years across two different companies. They make mobile games now in Malmö, Sweden. 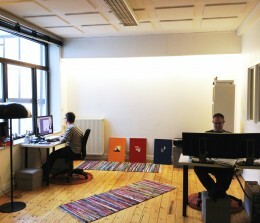 Their office is a lively place with a pine-colored floor, a massive window, a radiator, and rainbow colored throw rugs. Before, they made XBLA and PSN downloadable titles. Their last one was ilomilo. Simogo’s titles and that game share a lot in common. Simogo builds vibrant worlds with complimentary music, and it aims to keep its games as charming as they are simple. Simon is the art guy. He handles concepts and music. Gordon is the “one-man army.” He codes and programs. He builds frameworks. He even tackles design concepts. The duo has a fantastic relationship that goes beyond the creative glue that binds them. When Simon talks about Gordon, he’s almost reverential. The mutual respect these two have is also a big reason why Simogo makes games the way it does. They don’t argue. They listen, and then they execute. 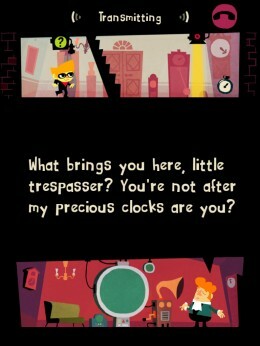 Simogo is one of the most fascinating mobile developers out there. It’s a brutally small studio that, somehow, drops some of the most compelling, idealistic, and fulfilling games on iPad and iPhone. 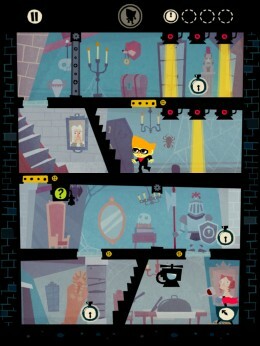 Beat Sneak Bandit, a rhythm and stealth mash-up, is loud and launched with a lot of fanfare, but the studio made the most noise with Bumpy Road, a somewhat depressing one-finger side-scrolling game that features an old couple, a car, and a road that can be manipulated with touch or swipe. The development of Beat Sneak went down in the usual Simogo way, which is to say, most of the good stuff happened on the fly. 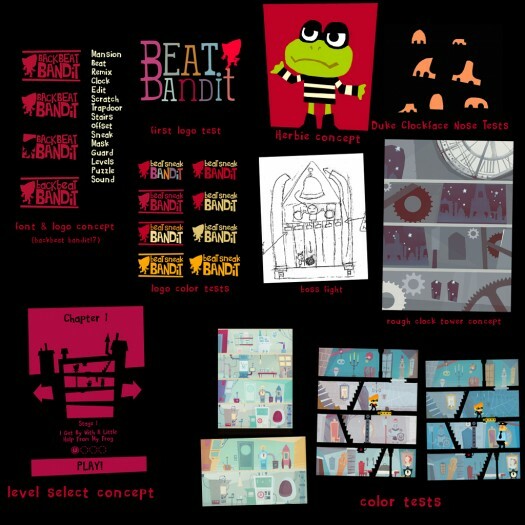 A pre-release "bonus" screen of Beat Sneak Bandit. It was taken to show off the resolution of the iPhone version. Simogo doesn’t like design documents. It’s also too small for meetings. Gordon and Simon twirl their chairs and talk when something needs to be discussed. If an idea pops up in their heads when they’re not at the office, they call each other. Simon thinks game design documents are good tools for big teams, but they fail to communicate feel, which is important to Simogo games. Bumpy Road was ponderous with a touch of zany. 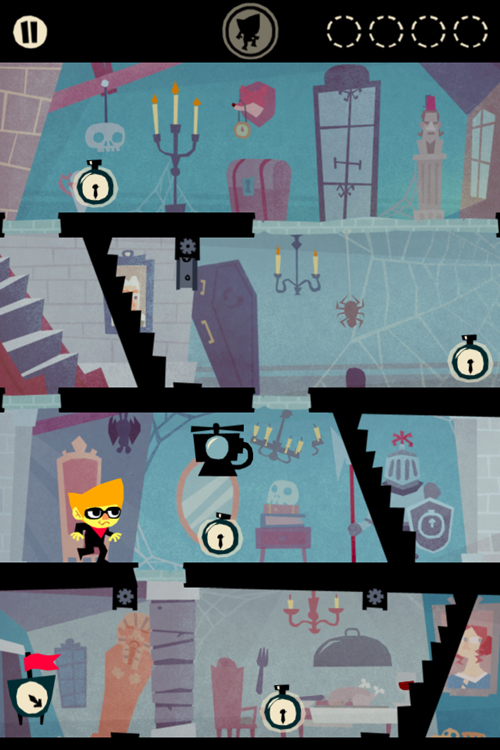 Beat Sneak Bandit is hyperactive and bombastic. Simon describes game design documents “like watching sheet music and saying you’ve heard the song, but the music is so much more than the composition," Simon tells me. “You could say that the way we make games is like jazz music; we improvise and put in new stuff as we go along." Simogo begins the actual game development part of production with a prototype just like any other studio. It dreams up an idea, and then it tries to flesh that out with a rudimentary demo. Some studios like to take this process especially slow by isolating experimental mechanics to produce proofs of concept, presumably to show publishers. Simogo goes deeper. It takes its pre-production demos and adds layers of actual production. “A lot of the appeal in our games is the full package, so we want to have that early on to get a feel for it," Simon says. The original idea for Beat Sneak came before Simogo released its first title, Kosmo Spin. At that time, Beat Sneak was an endless runner with a musical twist. If it had come out, it would have had you jumping and ducking to the beat, as opposed to sneaking to the beat in a series of interconnected levels. That idea morphed into something more, yet still different from what Beat Sneak is today, when the studio began working on the game in August 2011. Beat Sneak 2.0 had you swiping the floor of a level to offset the timing of the beat. Simogo called this mechanic “scratch reality." 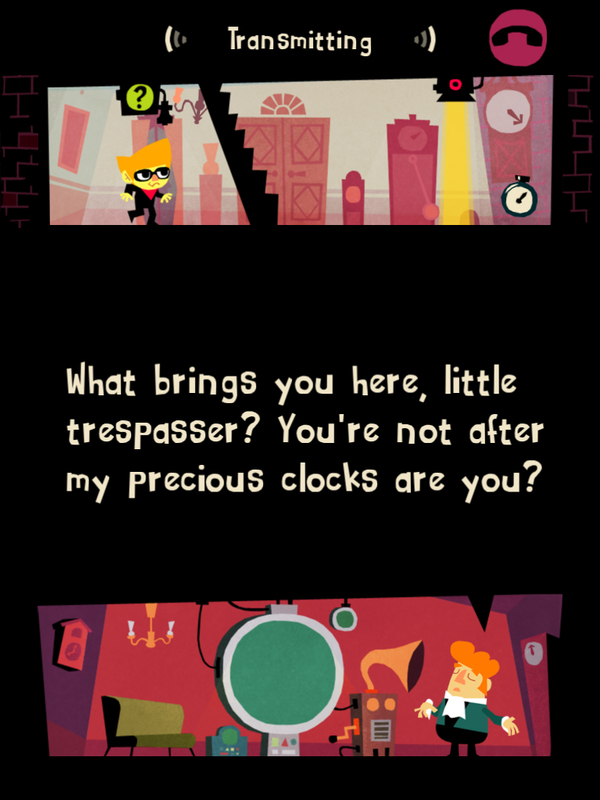 In this version of the game, you wouldn’t have control of the Bandit directly. Instead, you’d swipe against the beat to open doors and Bandit would follow a path automatically. Simon compares the feel of this version to real-time video editing. “This idea proved to be as complicated as it sounds, so we had a rough month in which we just simplified and simplified," Simon explains. “The concept of looping rhythm stages was something that was very cool to look at, we just had to come up with a suitable interface." At this point, the duo tackled the problem by thinking about the first pure idea for Beat Sneak. “Then we remembered the old rhythm-tap idea and everything just fell in place. We had two different prototypes after that. You would tap in beat to walk right, and backbeat to go to the left. That proved a little too difficult as backbeat is kind of a hard concept to grasp if you’re not a musician, so we wanted to downplay that." The other build, which was much closer to the version we’re familiar with, had Bandit flipping when he hit walls. However, backbeat reared its head again. This build had floor security lights you had to jump over by hitting a backbeat. 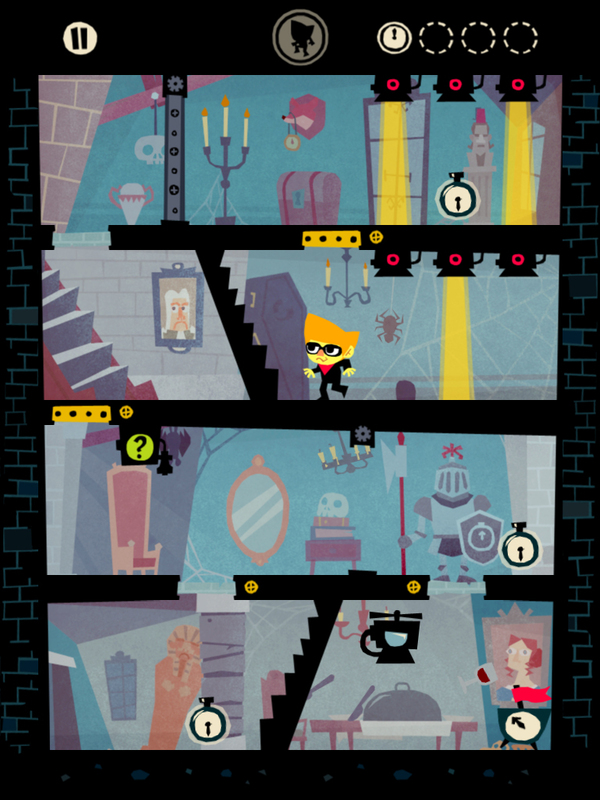 One of the first Beat Sneak Bandit screens. This is the iPad version. When Gordon and Simon do have a disagreement, it’s usually about planning. One specific instance that I had to pry out of Simon involves beackbeat, a concept that never made it to the actual game. Simon didn’t want Beat Sneak to be as easy as it is now, so he kept pushing for backbeat. Gordon was adamant that the mechanic need not exist, while Simon stubbornly held his ground maintaining that the game would suffer if it wasn’t included in the package. Gordon’s view that Beat Sneak should be as simple as possible to play eventually saw Simon agreeing with him. And just like that, the debate had a winner, and Beat Sneak Bandit became context-sensitive. This process of simplification is a hallmark of Simogo’s games, and the source of its most spirited conversations. Gordon presses to make things as simple as possible without killing what makes a product special. Simon seems to have a hard time letting features go. He doesn’t want the users to get bored. He also knows that simple is best when it comes to touch devices, though, so these disagreements get ironed out without getting bitter. “The thing we focus early on in all our projects is definitely the controls," Simon tells me about production in general. Beat Sneak‘s controls were a huge priority. The interface was, too. In the end, Simogo made an extraordinarily easy to play music game. Put a finger to the screen and Bandit moves. Hitting specific spots in the environment alters his direction. 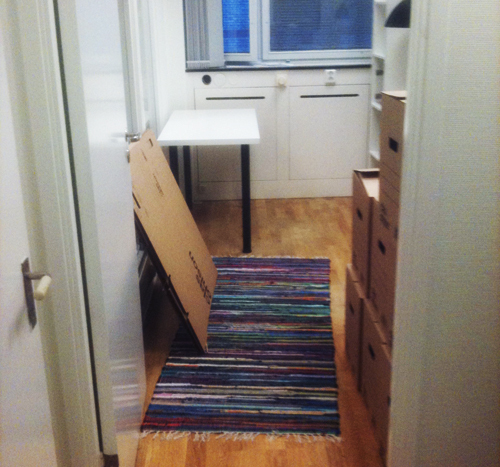 This is Simogo's old office. Seems... smaller. Simon describes the way Simogo works as a “publisher’s nightmare." It sounds like it. Publishers want design documents. They want to checkpoint developers. They want meetings. Basically, they want to make sure their investments are being used and that a game is hitting every milestone and well on its way to releasing when agreed. Roving deadlines, however, are a big part of the Simogo experience. Bumpy Road, its last game, released on May 19. After some contract work and work on a huge Bumpy Road update, Simogo started on Beat Sneak in August. The original release date was December. It hit this February, a couple of months past its original due date. This allowed Simogo to create more levels and that boss fight, as well as a few other features. After the backbeat change, Simogo stopped long enough to produce a ten-level vertical slice to submit to the Independent Games Festival. That November, it revealed the game with a fun little teaser that betrayed just two things: the rhythm and sneaking. “Around then we realized we were making something special, so we wanted to do it justice and expand it a little. We added new elements, like the vacuum buster, the time stopper, the shadow stages, the phone calls from Herbie and the Duke, and then decided to skip our deadline in December." Not competing during the Christmas rush was smart. The App Store freezes in late December. During this period, no new games are released, but the store is more vibrant than ever because developers basically dogpile it the week prior to the freeze. Games get forgotten, passed over. One of the coolest spots of design that Simon let me in on during our talks about the creation of Beat Sneak was origin of the game’s central figure, the Bandit. Bandit as we know him wasn’t a part of Beat Sneak at first. His final design came from a game concept called Mustache Bandits. That game’s tagline: “Every revolution starts with mustache doodles." Simon tells me not to ask about Mustache Bandits, but I have to press. It was a drawing game influenced by, of all things, Fruit Ninja. If it had actually seen the light of day, players would have been painting mustaches on posters guerrilla style and rewarded for factors like accuracy and speed. One of its big features would have been prompts like “UNI-BROW BONUS!" “We wanted to wrap this in a story of a gang of bandits starting a revolution against the mayor by painting mustaches, and they’d all have their own strengths and special attacks. Silly stuff," Simon says. I don’t think he understands how bad I want to play this game now. 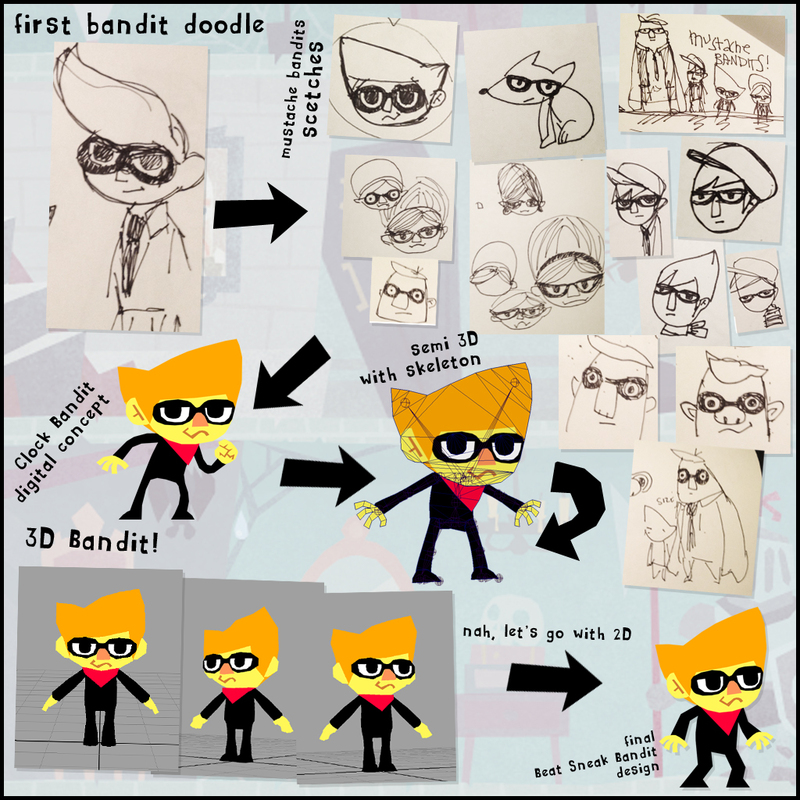 We’ve got quite an assortment of concept art of Bandit and his revolution, er, evolution over the development. 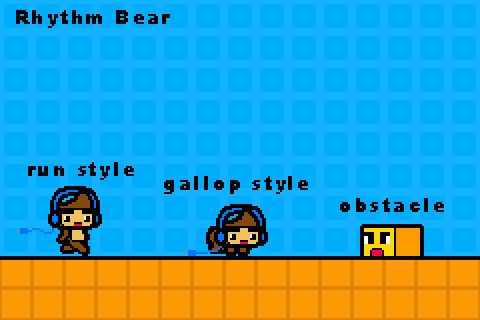 This is from Rhythm Bear, which was the game that ended up being the core idea behind Beat Sneak. Notice how the hairstyle managed to make it over, as well as the expressiveness of the avatar. The little blocks, not so much. Enlarge this one to see it in all its glory. The original bandit doodles all had one thing in common: a funky, defining hairstyle. This is, technically, a 3D project but Simogo uses 2D images. This isn’t directly related, but I wanted to share it. 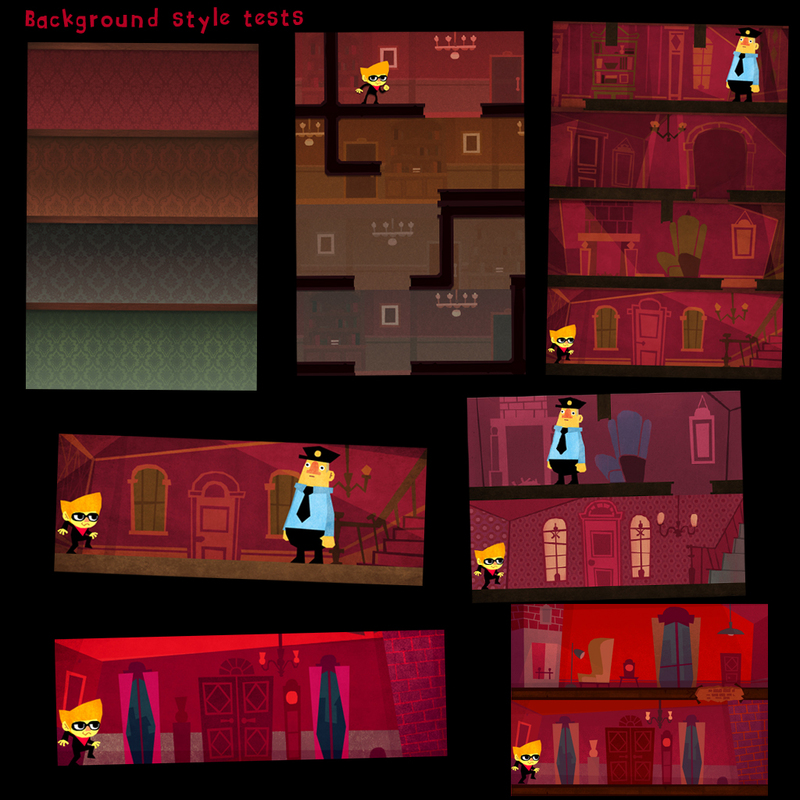 This is a style test sheet that helped solidify the tone of Beat Sneak. And those give you a good example of how many iterations everything – including the game’s name — had to go through. At one point, the game was called “Backbeat Bandit" or “Beat Bandit." You can tell the backbeat discussion was still going on while Simon was working on the game’s branding. This was the second teaser image released. Figuring out when Beat Sneak was “finished" wasn’t hard. Its external testers and Simon’s girlfriend pretty much made the decision. “The response from our testers was absolutely phenomenal, and you know when people actually want to continue playing not because you’re watching, but because they just want to." “There was a much greater initial response to this one than Bumpy Road, actually, from people we showed early. But, personally for me it was when my girlfriend told me it was the best thing we’ve made. Creatively, I trust her 100 percent." In February, after it was submitted to certification, Gordon and Simon celebrated with beer, vague celebratory tweets with pictures of wine glasses, and a few days off. When it actually hit the App Store a week later, Simon and Gordon spent a few days telling the press and any one who would listen that it was out. “We speak to fans, to media and just focus on trying to get the word out, which is very hard when you’re this small." It’s true. Even a site like ours misses big titles from established indie developers. Beat Sneak is a great game bolstered by tons of high scores in the press, but its first week didn’t bust the mark that Bumpy Road set in its first days of release. In Simon’s mind, the numbers aren’t matching up to the hype press stirred up. The fact that busted Pokemon rip-offs are able to take second place on the charts while Beat Sneak can’t crack the top ten is also frustrating. “In a week where an app that was a copyright infringing picture of a Pokémon took the second spot in the charts, that is especially heart-breaking,” says Simon. “But in the end, what matters is sales in the long run, and if we can keep steady sales, that’s good." Simon takes the high road, always. “We do understand that this is a bit more niche than Bumpy Road, more of a gamers game, though. Also, Bumpy Road was iPhone game of the week and Beat Sneak Bandit was iPad game of the week so I guess that comes into play too." Thousands of words and not one mention of clocks. Well, until now. Simogo isn’t a typical iOS developer. As cash-strapped as it might be, it still spends more than a single month on a game. It tests. It iterates. It builds the kinds of prototypes that are representative of more than just a clever mechanic. Gordon and Simon are a strong tandem because they check their egos at the door; they’re hugely talented, but they operate as a unit without the baggage. They disagree at times, but they also find answers. “Much like a recording artist we want our games to feel Simogo. It should feel like something that only we could make. So it’s hard to put a finger on what that is. Maybe it’s how everything produces a sound when you interact with it, how it feels tactile, the level of ‘polishness,’ or the art… I don’t know. “I say this a lot, but there is no single aspect in a game that is more important than the other. Gameplay is not more important than presentation, art is not more important than sound. Everything plays together to create something bigger than the sum of its parts." Of note, Simogo develops on a special platform that gives indie developers a chance to take the risks that Simogo does with each release. 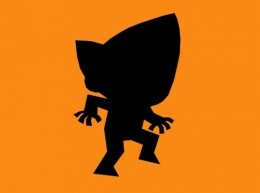 You’ll never see Beat Sneak Bandit on XBLA or PSN. It’s too unusual, too unique. Maybe too small, as well. This game deserves your attention if you haven’t bothered with it yet. It’s one of the best games on the App Store, and one of the most creative to boot. Its flavor, tone, and rhythm mechanic are all completely unique and fun. Simogo is moving on, by the way. The studio has just now started talking about “Game 4," and it isn’t quite sure if it’ll follow a similar development path. Simon describes this title as totally different from Simogo’s previous games, but it’s so early it might just end up as just another title that influences its next project, like Mustache Bandits.